George Nelson already worked for the furniture company Herman Miller from 1946-66 as creative director. 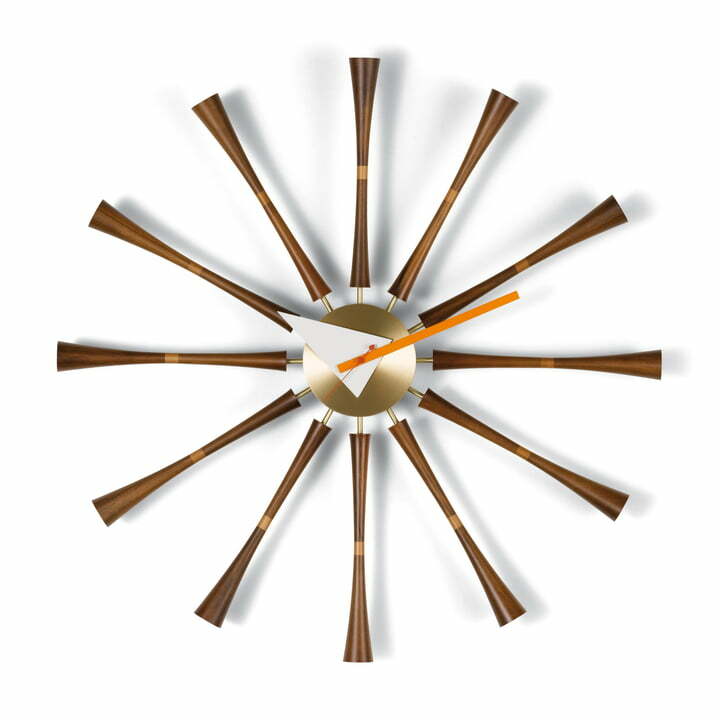 At the same time he designed table and wall clocks for the subsidiary Howard Miller Clock Company, catching the lifestyle of the 50s and 60s. Selected designs of that time are also re-edited in the Vitra Home Complements Collection. 1957 was a very productive year of the designer. He created more than 20 wall clocks in many colours and made of many materials, One of the mdoels of that period is the Spindle Clock. The body of this exciting timer is made of matt brass. The pointers have different colours and shapes. A triangular pointer for the hours in white and pointers for the minutes and seconds in powerful orange make it easy to read the time. The unusual hours-tubes are made of walnut wood and they spread a pleasantly warm atmosphere. The Vitra clocks from Georg Nelson are delivered with a sophisticated quartz clockwork.